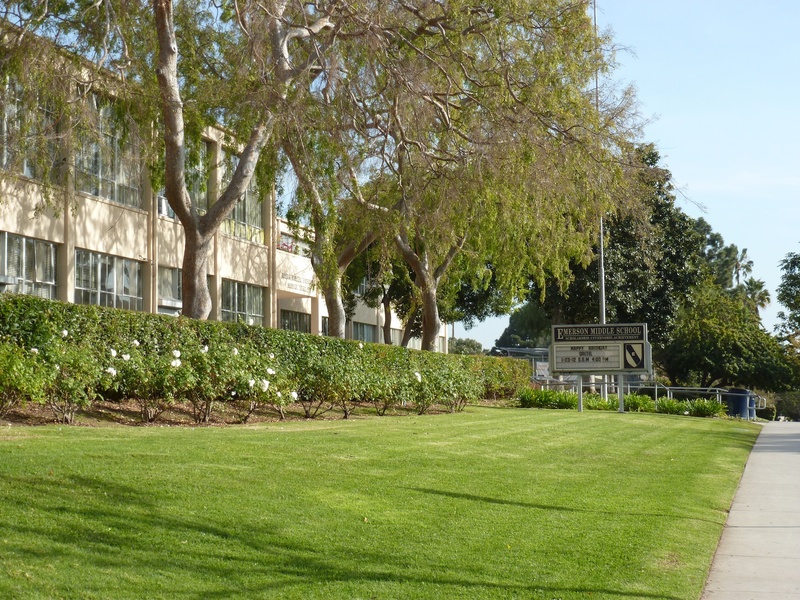 Ralph Waldo Emerson Middle School in Westwood, Los Angeles, is significant as one of America’s leading examples of 1930s Modernism in the International Style. Funded during the height of the Great Depression by the Public Work Administration (PWA) under President Franklin D. Roosevelt and largely completed by the fall of 1937, the campus is a tour de force. Widely published, it was a watershed in school design that influenced many schools in America and beyond. It is one of the nation’s first comprehensive examples of the integration of early 20th century approaches to public education and early 20th century Modernist architecture. The campus, designed between 1936 and 1939 by Neutra with some later minor remodeling by the legacy firm Neutra and Alexander in 1955, masterfully demonstrates the integration of these objectives into a design that went far deeper than formal façade treatment. The school embodies a radical reinterpretation of a school campus at every scale, including the overall campus layout that served a complex hierarchy of newly defined relationships; the landscaping that weaves the campus together into a unified composition; the introduction of several new kinds of spaces devoted to new aspects of progressive pedagogy; and the classroom setting itself, including furniture, day and artificial lighting, wall treatments and clever storage. Originally named the Ralph Waldo Emerson Junior High School, the campus was referred to as a “school plant,” a widely used contemporary term that linked industrial factories to schools and the production of goods to graduating productive and educated citizens. The campus retains a high level of integrity. In addition to its significance in pedagogical and architecture canons, the campus also reflects a response to new seismic requirements established immediately after the March 1933 Long Beach Earthquake, which destroyed 70 schools and damaged 120, most of them constructed of unreinforced brick-and-mortar masonry of multi-story freestanding buildings. Several early Modern architects in Europe experimented with similar ideas, and the denser, older, often crowded urban conditions there led to an additional and urgent motivation: the constant threat of diseases, especially air or water borne diseases, that swept Europe and England periodically through the 19th century and especially after World War 1 when the deadly Spanish influenza killed many more millions of people than the war itself. “International congresses on school hygiene, the first of which was held in Nuremberg in 1904, exposed the mediocre ventilation and sanitary installations in school buildings, as well as the lack of any medical surveillance.” England’s first open-air school, known as a “pavilion school,” was completed in 1907. Ernst May designed the Friedrich-Ebert Schule, 1930, in Frankfurt, Germany, with one story buildings for open-air classrooms. Each classroom opened to the outdoors (addressing health), and new types of group activity spaces were to promote the improvement of the students’ sense of initiative and autonomy (addressing individuation) as advocated by the New Education movement in Germany. Willem Dudok designed several schools in Hilversum, Netherlands in the 1920s in the same spirit of revolution and reinvention. The Impington Village college in Cambridgeshire, England, 1939, designed by Maxwell Fry and Gropius, incorporated these ideas in a middle school that also served the adult community after hours. The Crow Island School in Winnetka, Illinois, designed by Eliel and Eero Saarinen and Lawrence Perkins of Perkins, Wheeler & Will in 1939, became as famous as Emerson. It shares much the same provenance as Neutra’s two completed schools, which both took design cues from his earlier theoretical design, the 1925 “Ring Plan School,” a one-story campus shaped as a circular series of classrooms surrounding an open playground. The Crow Island campus includes self-contained group workspaces, flexible and light-filled interiors, sturdy materials of wood, brick, and stone, all on a rambling, one-story building footprint that extended out into the landscape. The project was considered so important that it garnered 13 pages in the August, 1941 issue of The Architectural Forum. It was the architects’ stated mission to create a “spirit of joy,” and be “warm, personal, intimate, inspiring and democratic, ” with classrooms – a far cry from the Victorian model decried by leading architect Joseph Hudnut, former dean of the schools of architecture for both Columbia and Harvard universities and responsible for bringing iconic Modernist architects Walter Gropius, Mies van der Rohe, and Marcel Breuer to America. “We know what the first public schoolhouses were like: those dour, tightly balanced boxes of brick, proportioned according to the rules … we know how freedom and inquiry came gradually to supplant precept and enforced receptivity, and how an education of scientific method overcame the earlier mixture of ‘guess and tradition’,” he wrote in an introduction to the article on the Crow Island design. Neutra’s progressive design for Emerson was named, along with Wright’s Falling Water and Gropius’s house in Lincoln, Mass., as one of the leading examples of 1930s in American modernism in the classic historical survey, Art and Life in America. However, his success was anticipated by his well-publicized addition to the Corona Avenue School, Bell, completed in 1935. Architectural historian Larry Speck named that small but idea-dense addition as “perhaps the most influential of the early modern school buildings,” even though the new one-story L-shaped wing consisted of only two kindergarten spaces and five classrooms. The design shares many character-defining features Neutra used more elaborately for Emerson. For example, many ground-floor classrooms featured a sliding glass wall that opened to a patio and then to a grass lawn, bordered on each side by hedges and above by tree canopies; operable clerestory windows on the corridor wall to ensure balanced light and natural ventilation; movable furniture that could be moved easily indoors or outdoors. These innovations, highly unusual at the time, helped to create a setting intended for progressive learning and a more creative, stimulating atmosphere. Neutra’s commissions for both Corona and Emerson were not easily won, according to a memoir by his widow Dione, which recalls the avid support of School Board members and noted educational reformers Nora Sterry and Grete (Margarete) Clark. Both, she said, were attempting to operate beyond traditional school politics of getting things done and to eliminate corruption when they could. “There was a whole building boom in Los Angeles, and for every set of buildings that was built, schools had to be built too, so there were just a huge number of schools being built during those years … and his Corona Avenue school deviated from all the standards laid down by the Building Division of the Board of Education,” Dione Neutra said. Mrs. Neutra’s remark about the building boom in schools was corroborated in a Los Angeles Times article. It reported that the school plant, conceived in September 1935, “is designed to meet the growing need for school accommodations in Westwood Hill. Within three months the enrollment increased to 710 students, by September 1936, the student body numbered 1,100, with a 350-student increase expected for 1937, thus indicating the growth of the residential district surrounding the school.” Neutra designed a school for 1,450 students. Neutra was notified of the Emerson commission on January 7, 1936 by H.E. Griffin, Secretary, Board of Education of the City of Los Angeles, and L.L. Cunningham, Assistant Secretary. The new buildings, oriented southwest on Selby Avenue on a 9.5 acre site, replaced temporary wood bungalows and tents that had served the students beginning in 1935. Neutra, with his employee, architect Peter Pfisterer, designed and provided extensive working drawings and detail sheets (199 drawings) for 12 buildings. The building was dedicated on Nov. 23, 1937, and the Dedication Program, beginning 7:15 pm that night, noted a total of 225 rooms, with classes and teachers listed for the principal buildings as well as those in “bungalows,” “shops,” and the “physical education building,” and included subjects such as math, music, metal shop, electricity, and printing. The large-scale strategies he implemented include breaking down the conventional monolithic school building into several low-rise structures. As the Los Angeles Times pointed out, it was to be “one of Los Angeles’s first schools of steel construction throughout,”(actually built as a combination steel-frame and reinforced concrete) intended to better resist earthquakes in accordance with the Field Act passed in April 1933. Each building was designed for a specific purpose for different kinds of learning both academic and pragmatic. Five major one- and two-story buildings included the classroom building; the “new assembly hall,” known as the auditorium; the administration building; the cafeteria; and the “physical education building,” or the gym. Secondary, smaller buildings included three identical “bungalows,” two “pavilions,” a craft building and a shop building (separated acoustically from the rest of the campus on the northeast corner) and all are extant, though have been altered to various degrees and other buildings have been added. [ELABORATE WITH SPECIFICS] Playgrounds and yards were located at the opposite corners of the lot. Careful landscaping, plantings, and trees linked and reinforced spatial relationships and afforded interludes of sunlight and fresh air between indoor activities, and added to the sense of a unified composition. The overall asymmetry of the campus as a work of urban design, as well as the asymmetry of the principal buildings themselves, reflected another established tenet of the International Style in which bilateral symmetry was rejected as historicist and static. Windows frames and doors were also painted with silver aluminum paint; the metallic paint was not only durable but intended to disperse light and blend in with the background. At Emerson, highly placed transom windows on corridor walls ensured the “democratic” distribution of daylight to each student as well as cross-ventilation, minimizing the threat of airborne diseases linked to crowded urban settings. The sliding walls led to patios sheltered by roof extensions, extending usable space even when raining. The patios opened to outdoor spaces of grass bordered by hedges. Abundant fenestration to allow for uniformity in distribution of light in the classrooms a well as lobbies and corridors, controlled by venetian blinds which have been installed throughout the entire building as well as corridor entrances and stairways. Commodious classrooms to allow for freedom of activity on the part of pupils in planning and executing projects. Sliding classroom walls and door opening from the ground floor class rooms to permit of pupil activity in patios adjacent to the classrooms. These devices double the working area ordinarily available to class work, at the same time allow for supervision by the classroom teacher. The library and textbooks rooms have been located on the same floor in adjoining rooms, to allow for general supervision of both … by the librarian and her staff. This arrangement allows for a constant flow of reading and illustrative materials to the various classrooms’ supplementary shelves, [which have been] installed as permanent equipment. This makes possible a decentralization of library services and a more intensive use of needed books by a larger number of pupils. The traditional blackboards have been replaced in large part by cork boards, allowing for frequent and more general posting of illustrative materials and pupil. Electrical outlets have been installed in classroom walls offering facilities for the use of radio and motion pictures both of which play important part in instruction. The main corridor on the lower floor of the building has been staggered at the entrance lobby to allow for greater freedom of movement on the part of large numbers of pupils; at the same time giving interest and character to floor design otherwise conventional and institutional in effect. The stairways, divided to control traffic, are well lighted with tall windows reaching to the top of the second floor ceiling offering inviting passage between floors. The library, though located on one side of the upper floor, is lighted from two sides, the corridor side having access to light through a tier of transom windows above the roof level of the adjoining corridor. Rest rooms for teachers of both genders providing adequate accommodation for relaxation. Internal corridors for offices for higher administration like principals, grouped together. Supporting pupil work rooms adjoining classrooms for storage for supplies, provide space for activity involving use of specialized materials. Art rooms form a T and receive northern lighting. Its roof is surfaced with a grilled flooring so that groups of pupils may assemble thereon for various types of class activity. Many of the class rooms are equipped with movable tables and chairs, offering flexibility in arrangement and freedom in adjusting to many of the informal practices prevalent in the class room procedure. 15. Artificial lighting fixtures in the corridors are recessed to conform to the simplicity of the line which characterizes both the interior and exterior of the building. The landscaping surrounding the buildings calls for plantings of trees and hedges bordering the classrooms, designed to lend not only utility but beauty as well to the immediate school environment. “I consider the year-long building activities an education in itself, with teachers adding comments based on their earlier stays in temporary bungalows, children participating and watching and asking questions, becoming ‘owners.’ The noise of the steam shovels, the concrete mixers and riveting machines could not be silenced, but they became a stimulus to arrange a whole year’s experience and training around this vital event of building, of building a school plant, ‘our’ school plant. “So many problems were introduced, so many questions brought up and dealt with, while the skeleton of the new school plant grew higher from week to week, while steel sash and glass were carefully unloaded from trucks, asphaltic roofing was laid, rows of shower stalls and shining plumbing fixtures were installed, and while grave inspectors were seen discussing matters with foremen and contractors. For the students and their parents the entire project grew into an ideal vast unit of experience with almost universal implications. School officials and especially the Emerson faculty were pleased. Paul E. Gustafson, principal at the time, wrote on November 23, 1937 in a typed press release, “The Emerson Junior High School has recently been completed and represents an outstanding example of an attempt to plan a school structure with modern educational purposes in mind. It was designed by Richard J. Neutra, an architect of international repute. It is evident that Mr. Neutra designed, definitely, a school building to meet educational needs. He has made an outstanding contribution in this direction and the ideas expressed in the Emerson Junior High School plant will undoubtedly be reflected in much of the development to take place in future school building planning throughout the United States.” Gustafson also contributed a feature article on Emerson’s innovations to Architect and Engineer, published June 1940. Evelyn and John Dewey, “Schools of To-morrow,“ (New York: E.P. Dutton, 1915), p. 205. Stephen Petrina, “Getting a Purchase on ‘The School of Tomorrow’ and its Constituent Commodities: Histories and Historiographies of Technologies,” History of Education Quarterly, Vol. 4, No. 1 Spring 2002. See entry, “School Buildings and Architecture,” Encyclopedia of Children and Childhood in History and Society, http://www.faqs.org/childhood/Re-So/School-Buildings-and-Architecture.html, retrieved Oct. 30, 2011. Dewey was a Chicago contemporary and occasional advisor of Wright (see “Schools and Modern Architecture,” by Larry Speck, Architype,January 13, 2011, http://architypereview.com/15-schools/editorials/4-schools-and-modern-architecture, retrieved Oct. 30, 2011. Dewey also founded The New School in New York with others including radical historian Charles Beard, one of Richard Neutra’s closest friends and father of William Beard, who commissioned a house from Wright in 1935 in Altadena, California. Impington Village College is now a Grade I listed building, Statutory List of Buildings of Special Architecture or Historic Interest. Grade 1 is the highest level of listing in Great Britain. Comment by Joseph Hudnut, The Architectural Forum, August 1941, 83. Thomas S. Hines. Richard Neutra and the Search for Modern Architecture, (New York, Oxford: Oxford University Press, 1982), 166. Nora Sterry, a graduate of USC with a master’s degree in sociology focused on the Chinese population in Los Angeles, served on the Los Angeles School Board from 1934 to 1941. Formerly the principal of the Macy Street School, the Nora Sterry Elementary School in Los Angeles bears her name. Sterry also had strong connections to the League of Women Voters. Dione Neutra, To Tell The Truth, interviewed by Lawrence Wechsler; Oral History Program, University of California, Los Angeles, 1983, 208-09. Los Angeles Times, “Work Well Advanced for Large Junior High School,” June 27, 1937, E4. UCLA, Charles E. Young Library, Department of Special Collections, Collection 1179, Richard and Dion Papers, Box 1515. Los Angeles Times, “Initial Units Planned for New Junior High,” May 3, 1936. E3. Architect and Engineer, June 1940, 43 – 45. Thanks for bringing this important campus to light. See my thesis at the University of Virginia for more on open air school precedents – Richard Neutra’s Active Learning Schools, 1927 to 1939 : Open Air School Precedents to Modernist Innovations.